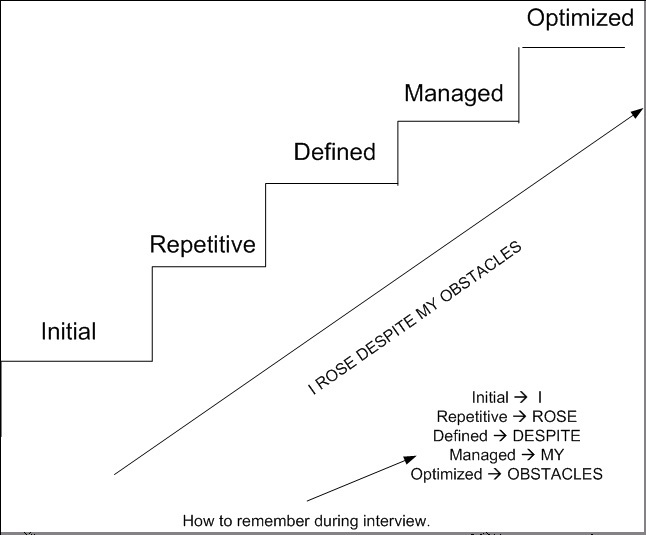 .Net interview questions: - Elaborate the five levels in CMMI? At maturity level 1, processes are usually ad hoc and the organization usually does not provide a stable environment. Success in these organizations depends on the competence and heroics of people in the organization and not on the use of proven processes. In spite of this ad hoc, chaotic environment, maturity level 1 organizations often produce products and services that work; however, they frequently exceed the budget and schedule of their projects. Maturity level 1 organizations are characterized by a tendency to over commit, abandon processes in the time of crisis, and not be able to repeat their past successes again. At maturity level 2, software development successes are repeatable. The organization may use some basic project management to track cost and schedule. Process discipline helps to ensure that existing practices are retained during times of stress. When these practices are in place, projects are performed and managed according to their documented plans. Project status and the delivery of services are visible to management at defined points (for example, at major milestones and at the completion of major tasks). The organization has set of standard processes, which is the basis for level 3, is established and improved over time. These standard processes are used to establish consistency across the organization. Projects establish their defined processes by the organization's set of standard processes according to tailoring guidelines. The organization's management establishes process objectives based on the organization is set of standard processes and ensures that these objectives are appropriately addressed. A critical distinction between level 2 and level 3 is the scope of standards, process descriptions, and procedures. At level 2, the standards, process descriptions, and procedures may be quite different in each specific instance of the process (for example, on a particular project). At level 3, the standards, process descriptions, and procedures for a project are tailored from the organization's set of standard processes to suit a particular project or organizational unit. Using precise measurements, management can effectively control the software development effort. In particular, management can identify ways to adjust and adapt the process to particular projects without measurable losses of quality or deviations from specifications. Sub processes are selected that significantly contribute to overall process performance. These selected sub processes are controlled using statistical and other quantitative techniques. Maturity level 5 focuses on persistently improving process performance through both incremental and innovative technological improvements. Quantitative process-improvement objectives for the organization are established, continually revised to reflect changing business objectives, and used as criteria in managing process improvement. The effects of deployed process improvements are measured and evaluated against the quantitative process-improvement objectives. Both the defined processes and the organization set of standard processes are targets of measurable improvement activities. Process improvements to address common causes of process variation and measurably improve the organization's processes are identified, evaluated, and deployed. Optimizing processes that are nimble, adaptable and innovative depends on the participation of an empowered workforce aligned with the business values and objectives of the organization. The organization's ability to rapidly respond to changes and opportunities is enhanced by finding ways to accelerate and share learning. A critical distinction between maturity level 4 and maturity level 5 is the type of process variation addressed. At maturity level 4, processes are concerned with addressing special causes of process variation and providing statistical predictability of the results. Though processes may produce predictable results, the results may be insufficient to achieve the established objectives. At maturity level 5, processes are concerned with addressing common causes of process variation and changing the process (that is, shifting the mean of the process performance) to improve process performance (while maintaining statistical probability) to achieve the established quantitative process-improvement objectives. Below is the figure, which will help you remembering the same.